Reports are trickling in from the passengers aboard the Carnival Cruise ship that was stranded for days in the Gulf of Mexico. After a fire in the engine room disabled the ship, apparently the crew started giving away booze — and then, when people went nuts, had to stop giving away booze. 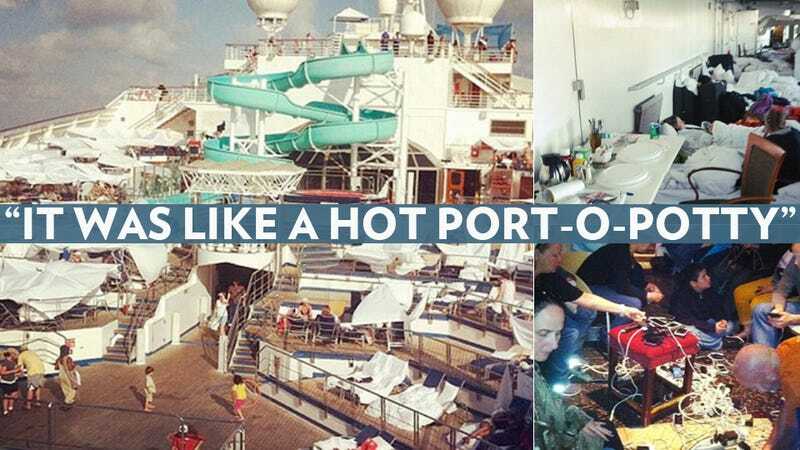 Meanwhile, the sanitation situation was gross and "the stench was awful," according to a 50-year-old from Dallas woman who spent her birthday on the ship. "A lot of people were crying and freaking out." "My mother is a diabetic, and they would not even come to the room because she cannot walk the stairs to help her with insulin. She hasn't had insulin in three days." "The ship's afloat, so is the sewage." "Pipes are busting, I know the sewer is backing up, and water is in the cabins, and it's just a nightmare." "Just imagine the filth… People were doing crazy things and going to the bathroom in sinks and showers." "The floors were mushy — you had this smell in your throat that you couldn't get rid of." "There's poop and urine all along the floor. The floor is flooded with sewer water ... and we had to poop in bags." "People were hoarding food — boxes and boxes of cereal, grabbing cake with both hands." "The worst thing was the toilets. Going in them little red bags and we just had to put them in the trash. It got to the stage when they said if you have to urinate go in the sink or the shower." "We now know things about each other we really don't need to know." "It was like a hot port-o-potty, and when the ship tilted, [the sewage] would spill." "There were some people that were hungover and drunk and were too lazy to do what the crew said when it came to precautions... they were throwing up on the carpet and the stairs, throwing up in the toilets that weren't supposed to be used." "Like Katrina in the Dome, except it's afloat." "I truly, truly, truly thought the boat was gonna tip over because it slants at, like, a 45 degree angle one day and the next day it is to the other side." "There were people screaming obscenities in the hallways, wasted." "It's degrading. Demoralizing, and then they want to insult us by giving us $500"
"I want a hot shower and a daggum Whataburger." "This was my first and my last cruise." "There are some who have over-exaggerated and dramatised it, and are going to milk it for all it's worth." "I just wanted to vomit, like every second probably," said 12-year-old passenger Allie Taylor. More here: "Some lady was SELLING Immodium. Woman died yesterday of a heart attack. Today they cleaned the hell out of this ship, served LOBSTER FOR LUNCH, crew is wearing matching hats." And this just in: "Carnival rescue bus breaks down while bringing passengers home". Oy.